The Golden Valley Quilt Guild is a non-profit organization founded in 2002. Our membership is usually between 80 to 100. We have meetings, or events, eleven months a year. We have speakers, share our ideas, have stash sales, enjoy Zephyr Cove and Mercy retreats, and work on community service projects. A group, started by Donna Palmer, Karen Gray, and Yvonne Huber, which included about 22 or so, had been meeting a few times in the Roseville home of former member Judy Kennard. They found themselves weighing the pros & cons of becoming an actual quilt guild vs. just a group of ladies getting together and sharing their love of quilting. On August 29, 2002, they voted to incorporate and become a guild. The group decided on a guild name and continued to meet at Judy’s home for the rest of the year. However, they quickly out grew the space as the membership grew. They knew Roseville already had a guild, and they also knew that they wanted to meet in the Citrus Heights/Fair Oaks area so, Arlene Lanch, Mary Sackett and Karen Gray became the committee to locate a permanent place to meet. After the three met with the pastor, they began to meet at St. Mark’s Lutheran Church in Citrus Heights. They also appointed a Bylaws Committee to get the process going to become tax exempt. In 2003, Judy Kennard moved to Oregon, but she has driven back down here for both of our Fundraising Luncheons. 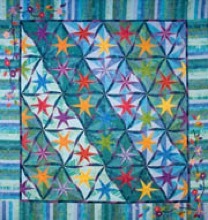 The purpose of the Golden Valley Quilt Guild is to promote and encourage members’ interest in quilts and quilt-making in an environment of mutual support and fellowship, and to offer them an opportunity to participate in charitable projects through donations of quilts and other resources.